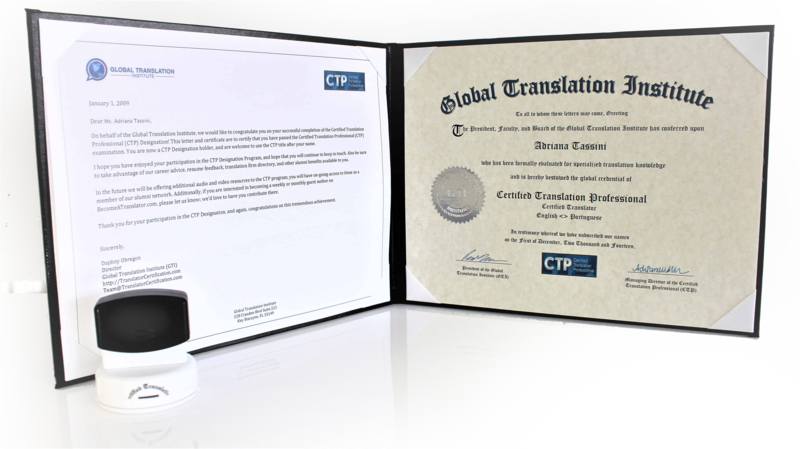 The Certified Translation Professional (CTP) is a leading accredited certification program designed exclusively for those professionals who want to work in the translation industry. Being the leading company we have over 15,000 trusted CTP designation holders within this space and another 29,000 member Group. This course is modeled after many online courses offered by Ivy League institutions. The CTP Designation is a self-study program and the exam is administered online from your place of work or home. Through out this course you will also learn how to avoid common mistakes while working in the field as well as how to start your own Translation Company. The course is Based on the Translator Training Text Book. As such students are tested on their knowledge of the book along with their translation skill in order to earn their designation. The CTP provides the translators with the capabilities to gain qualifications and credibility in the translation industry. Earn your Translator Certification in as little as 3 months! By Registering for the CTP Program, you will gain access to the online classroom where you will find 11 audio interviews, 41 video modules, study guides, practice test, and additional career resources. 10 Monthly Payments of $58.75 PLEASE BE ADVISED YOU WILL NOT RECEIVED RESULTS OF YOUR EXAM UNTIL PAYMENT HAS BEEN COMPLETED IN FULL. The CTP provides the translators with the capabilities to gain qualifications and credibility in the translation industry. We offer this course in 23 languages that you can choose from the drop-down menu. This is a self-study course in which you will study from the course materials and once you are ready you can schedule and complete the online test. Choose your language pair from the drop-down menu. This course will certify you as a professional translator by testing your ability to translate between the two languages. It also teaches you the business side to work as a translator, such as marketing, positioning, negotiating and bidding, and quality and ethics. The course is not language specific and does not train on the English language, Target Language, or how to translate between the languages, you should already have a firm grasp of both languages to pass the exam. bility to apply for more positions which are highly competitive and require specific designations or set levels of experience in the translation industry. Improve your resume while also upgrading your ability to work as a successful translation professional. All alumni gain free exclusive access to our database of over 1,000 global translation agencies and their full contact details in Excel ($300 Value). Become more knowledgeable in the Translation industry, which will save you time in making decisions which shape how you grow your translation career or business. Completing our Translation Certificate is a great way to let employers know that you have made a serious commitment to becoming an expert in the translation field. Become more confident about your ability to perform translation services and manage your career or translation business. You will become capable of working as a translator in the languages of accreditation shown on your certificate. Being certified can give you credibility when approaching new potential clients. Advance your business or career by raising your level of translation knowledge and increasing your ability to work quickly and effectively. Specialized knowledge is valuable and mastering the basics allows you to work more efficiently than your competitors. All CTP alumni gain author status on our industry leading blog, BecomeATranslator.com. Alumni may post original industry articles on BecomeATranslator.com after completing our program. Speak the language. Earning the CTP Designation assures that you can attend conferences, interviews and other networking events while being able to contribute to conversations and understand discussions about current events or trends within the industry. Gain valuable insight into your own career and business plans. The broad and in-depth reading and studying required to earn the CTP Designation will help you decide what you should be working towards. All participants gain access to our Library of the Audio Interviews, which we have conducted with experienced translators from all over the world. By listening to these interviews you can receive valuable translation career advice directly from trusted experts in the industry. Download a sample translator audio expert interview here. 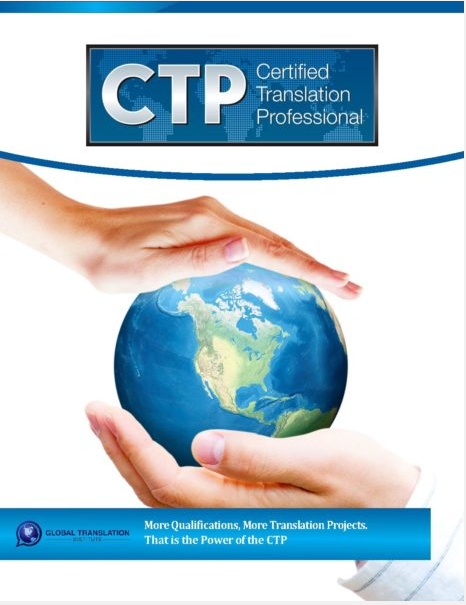 Those who join the CTP also gain access to our Translator Training Video Platform, which provides 50 instructional videos as well as audio study tips and a translator resume template. Download a sample video module from our program here. After joining you also get free access to our $300 database of over 1,000 global translation agencies and their full contact details in Excel (Sold for $300 at DatabaseofTranslators.com). CTP Alumni also get “author status” on our leading websites such as BecomeATranslator.com, where they can grow their industry profile and contribute original articles to the website. Certified Translation Professional (CTP) Alumni are sent the following PDF certificate for free after successfully completing our timed and graded online examination. You can preorder the certificate and stamp today. You will receive them both after completion of the program or you can purchase it after you pass. We print the certificate on parchment paper using a laser printer and apply our embossed seal. The certificate is sent in a professional certificate holder with our logo and branding on the exterior. The stamp is personalized with your Full Name and Certified Translator Designation number, which is unique to you. The stamp allows you to easily leave your mark on any translation work proving you are a Certified Translator.